Major Announcement at Esmod Fashion Show Last Night! Alia Khan – IFDC Founder and Chairwoman, Islamic Fashion and Design Council (IFDC) announced the launch of a whole new concept in fashion weeks which they call, iFash™ 101 Week. The initiative is expected to bring exciting change and a significant contribution to the development of the global fashion scene, and will be rolled out in collaboration with the French fashion institute, Esmod. 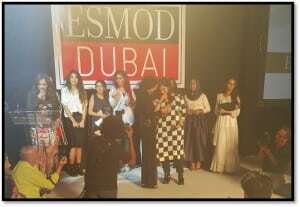 The announcement was made last night at Esmod-Dubai’s 2015 fashion show in Dubai, UAE, where IFDC Founder and Chairwoman, Alia Khan was also invited on the jury and was asked to award the highly coveted Jury Award to the most talented designer. “iFash 101 Week will be the first time new designers will share the runway with established designers – a powerful way to get promising new talent to be taken seriously, but the key is in the way we present it. This will be a fashion week of the highest caliber. Along with top notch production quality, there will be a keen focus on branding and revenue opportunities for all designer participants; we are serious about sourcing the best ways for commercial viability for the designers – that is the life line they need the most amount of help in. In conjunction with Esmod’s Tamara Hostal and Denis Ravizza’s expertise, the selection process will be fair and balanced. The establised designers will play a tailor made key role, you’ll just have to wait and see what that is”, says Khan. Very exciting days ahead for the field of iFash™ and modest wear as IFDC paves a path for industry players to get their best chance at the valuable Islamic fashion market which is headed toward a $484 billion demand. “Through Tamara and Denis we’ve seen a commitment to excellence and values that Esmod is known for. I can’t think of better people to lead us into this meaningful partnership which will be on a global scale. We’re going to see the way fashion should be done and there will be no compromising on values and good will toward all”. Khan’s news was received with tremendous excitement as the buzz flooded the hall with much chatter about the event’s potential. Pre-production of the fashion week is under way and dates for the first few cities will be announced in a few weeks. Islamic Fashion and Design Council Founder and Chairwoman, Alia Khan, announced the launch of their disruptive model for fashion weeks, iFash™ 101 Week, at Esmod-Dubai’s 2015 graduate show last night. Here, she presents the Jury Award to the top designer. The Islamic Fashion and Design Council (IFDC) is the world’s leading fashion and design (art, architecture, interiors etc.) council representing the Islamic economy and its stakeholders. IFDC, a leading advocate for Islamic and modest fashion, art and design professionals and aspiring talent, has an array of products, services, and effective training programs for all levels. Its platform is designed to ensure the success of Islamic fashion and design in the global marketplace as it facilitates the industry players in accessing the vast revenue streams. IFDC aligns itself with leading and budding mainstream and Islamic/modest fashion and design brands, government organizations, institutions, corporations, and global conferences, events, and fashion weeks to ensure a powerful, sustainable and supportive presence. With offices recently opened in New York City, and London to follow, IFDC will have a presence in a total of five cities by the summer of 2015. For more information please visit www.islamicfashiondesigncouncil.org, or contact us at office@islamicfashiondesigncouncil.org for details regarding IFDC events and/or media opportunities.